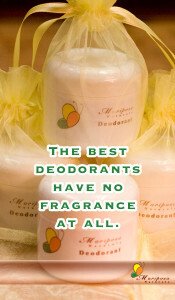 Lately, I have noticed that some people tend to confuse the terms antiperspirant and deodorant. It makes sense, in a way, because they both work to achieve the same thing. Let’s face it, none of us wants to smell bad. And, for some, we also concerned about the amount of sweat we produce. I’ll start with my own experience. Many, many years ago, I tried using antiperspirants. I developed small, painful lumps in my pits. That went away when I changed to a deodorant. My husband had a similar experience. Today I understand why, and I’ll get to that shortly. Both types of products – antiperspirants and deodorants – have essentially the same goal. And that is to eliminate body odor. It’s how they do it and the ingredients they use that matter. Antiperspirants work by clogging your pores. Therefore, an antiperspirant works by seemingly preventing sweat. Except the don’t actually prevent sweat, they work by clogging the pores. The sweat still happens, but it likely finds another outlet. Or it could back up in the body. This isn’t really a good thing. We sweat for very good reasons. 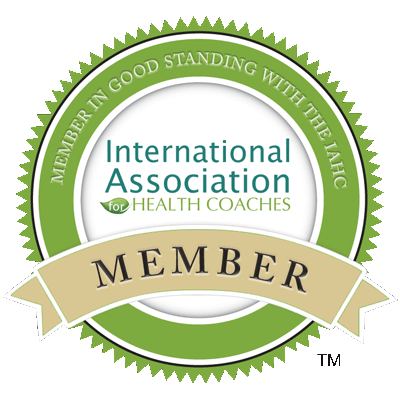 Two of them are to remove toxins from the body and to help cool the body down. So clogging the pores may not be a good thing. I believe that the problems I encountered when using antiperspirants was due to the build up of toxins that were unable to leave through the pores. The active ingredients in antiperspirants are aluminum salts. That fact alone is enough to make many people want to stay away from them since there are some reports linking aluminum to breast cancer. It’s also interesting to me that antiperspirants aren’t required to fully stop sweating to use that name on the label. According to this Huffington Post article, “the FDA only requires that a brand cut back on sweat by 20 percent to boast ‘all day protection/ on its label.” That explains why you find antiperspirants paired with deodorants and perfumes – what the antiperspirant doesn’t catch, the deodorant or perfumes will make smell better. The best deodorants have no fragrance at all. Antimicrobials -The best deodorants have antimicrobial properties that prevent the growth of the bacteria. No bacteria, no odor. Odor-aborbing Substances – Products such as baking soda will absorb odors. If you’ve read this blog for long, it won’t surprise you to know that I believe the best deodorants have no fragrance at all. Even if you’re not sensitive to fragrance, ask yourself why you would need a fragrance in your deodorant? In a world where every product comes with a fragrance, why do you want ALL of those smells? Better to find a deodorant that works well and doesn’t NEED fragrance to hide the fact it doesn’t work well! if I finished this post without talking about Mariposa Naturals Deodorant. It’s the one in the picture at the top of this page. Using NO fragrance to mask odors – because it doesn’t need to! 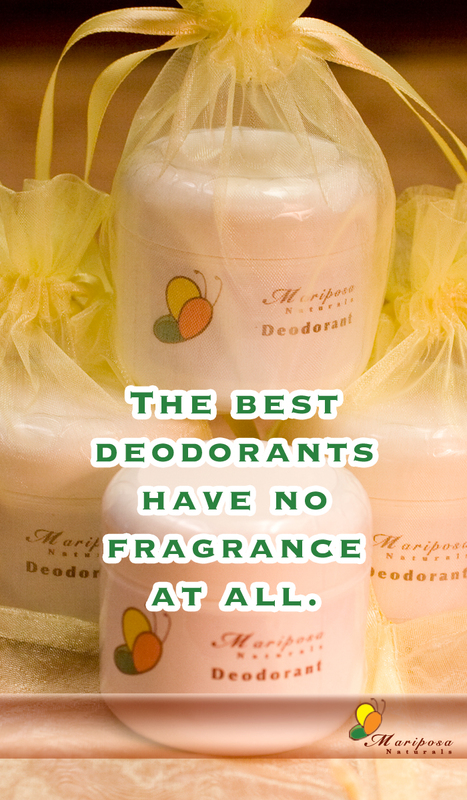 So, for a pure & natural deodorant experience, try Mariposa Naturals Deodorant! Have you heard? Mariposa Deodorant is for sale! Visit the sale page on Mariposa Deodorant’s site for more information. Do you use antiperspirant or deodorant? Or did you even know the difference?